Two cutting boards, three pots, and one blender later, we had a beautiful pot of verdantly green, fresh-flavored risotto. Despite all the cleanup that looms as I write this post, the risotto was totally worth it. 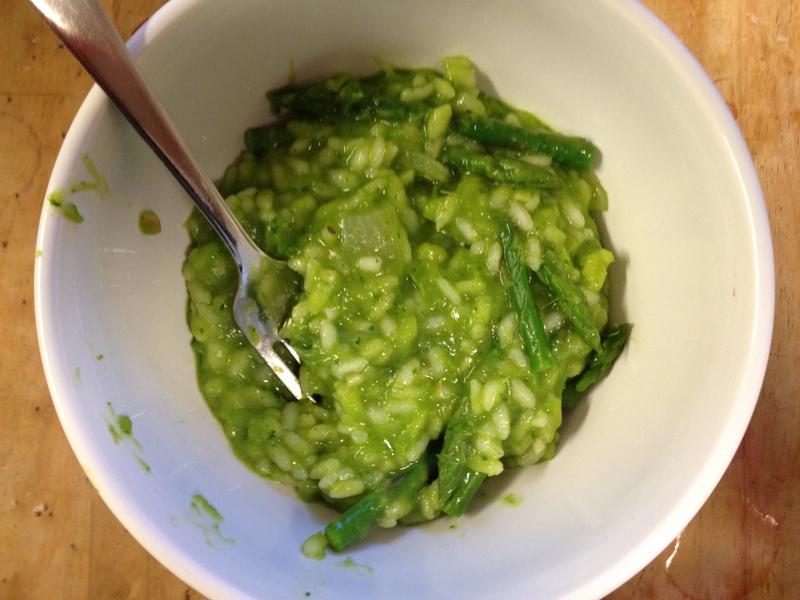 The rice was chewy and the puréed asparagus stems were a) a great way to use those unwanted stalks and b) an absolutely delicious sauce that made the risotto even gooier. This risotto literally tastes like springtime in a dish. It’s fresh, light, and yet still has a heartiness to it, reminiscent of winter. Speaking of winter, I wish someone would tell the New England weather it’s time for spring, and the snow needs to stop already. I have my cute sundresses all lined up in the closet, just waiting to be worn. But for now, it’s boots, chunky sweaters, and curses hurled into the frigid wind as we wait, patiently, for the day we can unearth our shorts and sandals. 2. Heat 1 tbsp butter and the oil in a heavy pot over medium-high heat until the butter melts and sizzles (but doesn’t brown); add the shallot and 1 tsp salt and cook until softened, about 1 minute. Add the rice and stir to coat with fat, cook until the rice begins to crackle, 1 minute. 3. Pour in the wine, stir it around and boil until its evaporated. Pour in 2 cups of the broth; bring to a steady bubble (not a violent boil) and cook until absorbed, stirring frequently for 7-10 minutes. 4. Add another cup of broth, another 1/2 tsp salt, and continue cooking until almost absorbd. Watch carefully at this point – the rice will be nearly ready when the grains have swelled in volume and the liquid becomes thickened. Taste the rice – it should be tender all around, and very slightly al dente at the core. Add more liquid if needed, 1/4 cup at a time until you feel it’s done. There should be some thick, starchy liquid still left in the pot. You might not use all the broth. 5. Remove the pan from the heat and stir in the reserved asparagus purée, remaining butter, and half the cheese. (We didn’t add in cheese and it was fine.) Stir in the lemon juice and taste the risotto for seasoning, adding more salt to taste if needed. Gently stir in the asparagus tips. 6. (Optional) Serve in bowls, topping each one with some radish, watercress, and fennel fronds with additional cheese on the side.